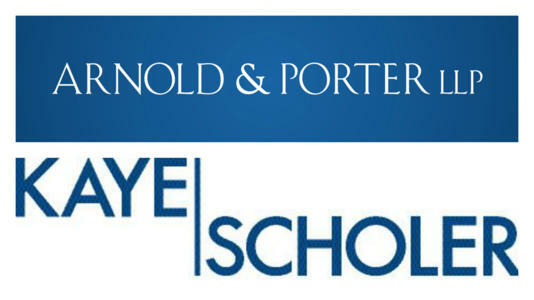 On Thursday November 10th 2016 Arnold & Porter and New York's Kaye Scholer announced that they will merge in the New Year to create a new, 1000-lawyer firm. This marks the biggest BigLaw deal of a year. The merger will be effective January 1st 2017.The firm will be known as Arnold & Porter Kaye Scholer and will have offices across nine US states and four international offices. The combined firm practices will focus on intellectual property, litigation, and finance and corporate. Both firms struggled financially last year. Arnold & Porter’s gross revenue fell 6.4% in 2015 to $650 million and Kaye Scholer’s went just over 1% to $370 million. Leaders at the firms said the pending marriage was prompted by complementary practices in areas like pharmaceuticals and FDA matters, and the need for more territory in a handful of major markets.